A reliable source for Automatic Parts Washers information and a resource for accessing leading Automatic Parts Washers and suppliers. Most parts washers today are semi or completely automatic. They are controlled by computer software and perform automated tasks like loading, washing, rinsing, drying and unloading, all without worker assistance. Automatic parts washers greatly reduce the cost of manual labor, are much faster than non-automatic machines, and have the capability to clean parts in very high volumes at a faster rate. Automatic Parts Washers Most parts washers today are semi or completely automatic. They are controlled by computer software and perform automated tasks like loading, washing, rinsing, drying and unloading, all without worker assistance. Hardware factories that produce small tools like fasteners run their newly formed products through parts washers in high volumes. Some medical facilities sometimes use them to sanitize large amounts of reusable instruments and supplies. Recycling facilities also use automatic parts washers. Before a used item like a plastic bottle or drum may be melted down and formed into a new product, it must be fully cleaned and sanitized, and this is often done with parts washers. All types of parts washers, including immersion, rotary, spray and agitating, which are all designed to clean specific products, are available semi or fully automatic. These washers are controlled by either CNC (computer numeric controlled) systems or PC software. They move the parts through rinse, wash and dry stages continuously, and control cleaning solution levels, heat, pressure, speed, applied load and flow rate. These options are all pre-programmed and adjustable. Semi-automatic parts washers have automated stages but may require manual loading and unloading or will work in conjunction with a separate conveyor system. They are often equipped with a liquid recycling system, which reduces cost and provides environmental protection. Parts washers that are controlled by a CNC system use one or more microprocessors and storage units. They often work with CAD/CAM software systems that instruct the machinery to execute exact movements necessary to clean the parts. 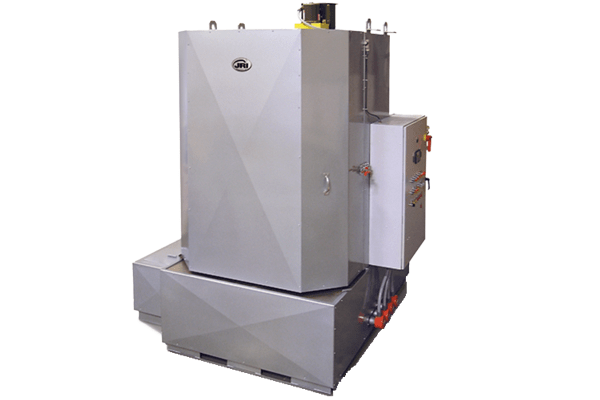 Automatic parts washers provide many benefits; they cut solvent use by 90% and increase the cleaning quality and speed, which results in lower expenses and higher quality results.